Okay so LJ has instituted a new feature, I like it and I hope you will as well. It is called Recent Posts or Recent Entries. So the question is how to I get something recent posts below my journal entry. First, you have to be using one of the themes that it is enabled on. When LJ first introduced this feature it was only available with Minimalism, Expressive, Air, Chameleon but it suddently showed up on Flexible Squares a few days ago and I'm guessing they are slowly but surely adding it to other layouts. So far no word on whether or not it will be available for communities (though I'm hoping). 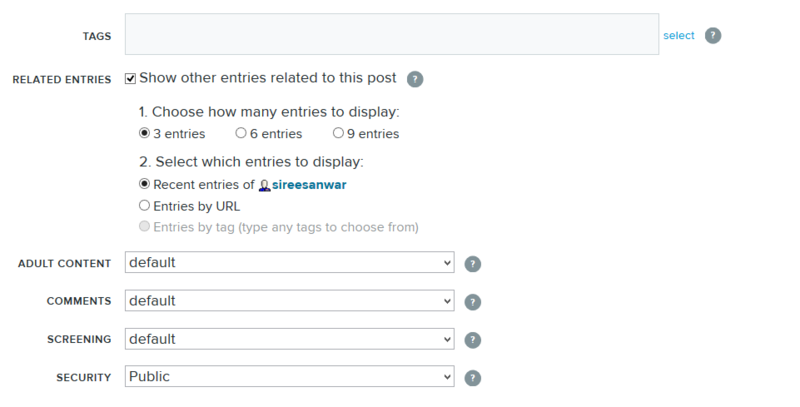 Second, now that you are sure you are using the listed themes go to post something or simply edit an existing post. If you see the highlighted bit of text you'll be able to enable this feature on your journal. Third, click on the Show other entries related to this post. You will see multiple options. So if I'm choosing 3 entries and the most recent entries. 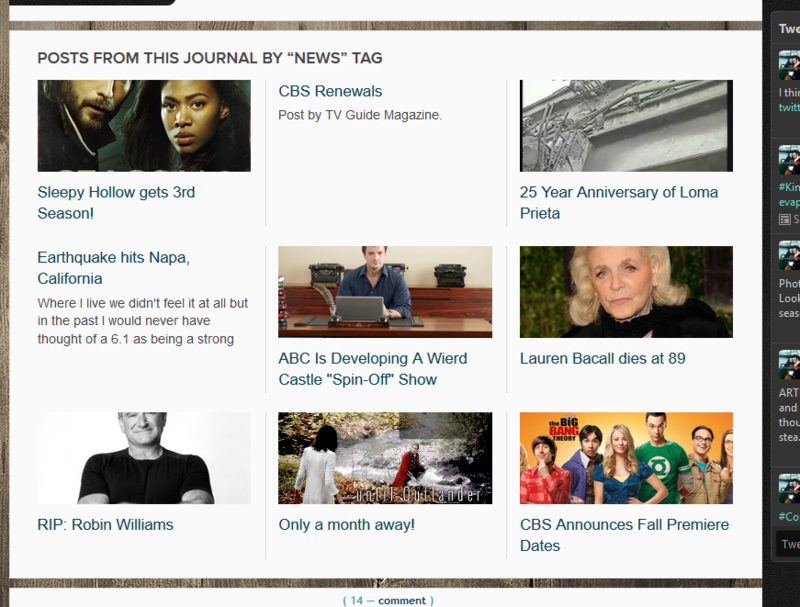 Fourth, you can also choose by URL and put in the posts you want shown. I think this would work really well if you had parts to fan fictions or parts to other discussions. Fifth, another option which is also really interesting is by tag. 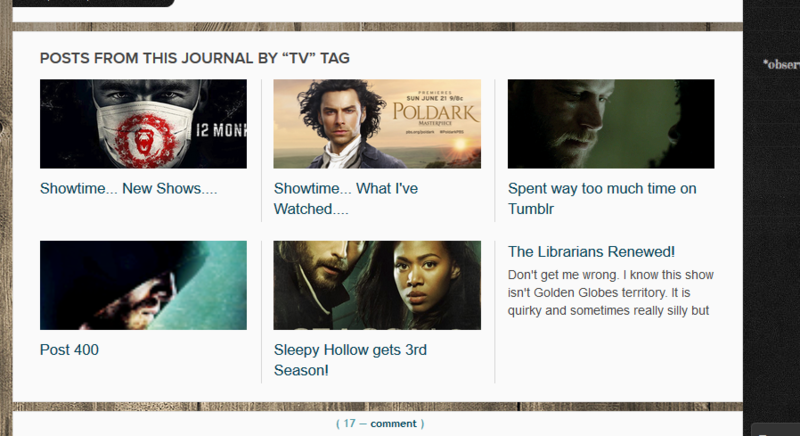 This way I can show just posts that are related to the TV tag on my journal. Here is what a by Tag would look like for 9 entries. Notice some posts do not have pictures. For me these are posts with Facebook embeds and videos or posts that simply do not have an image. I like that these purely text entries have small except from the beginning of my post. Also, I believe the way it works is a public post will show recent, tagged, etc posts that are public. Friend locked posts will show Friend locked and public and so on and so forth. I can see people not liking this feature but it also doesn't have to be used, however, I see the benefit. Especially with your fan fiction, show discussions, and so on. I can see icon makers loving this too. What to learn a bit about coding for this feature? Click Here. Hope that helps you with this feature and should you have any questions please comment and ask me. I really like the idea of this feature. Can definitely see the advantages of it. It sure comes in handy for fanfiction and the like. I really hope they're going to make it avaiable to communities some time; it would be awesome for icons and such. It really would. I think that would be rather neat. 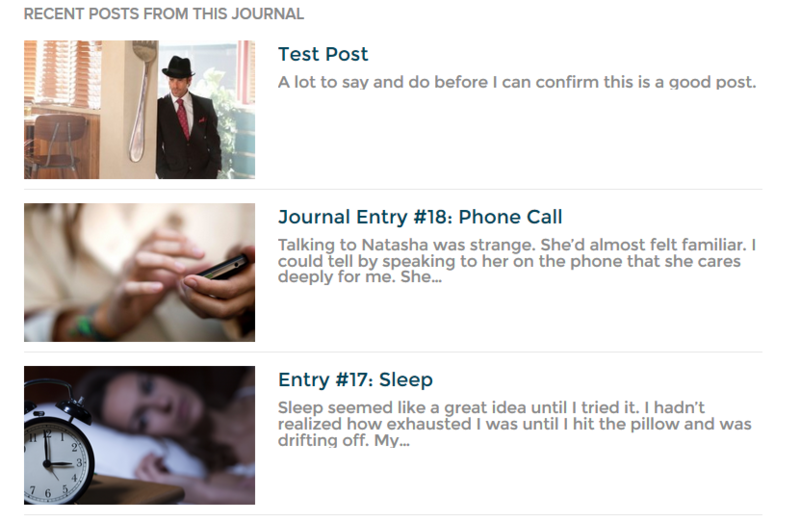 Plus it lets other see posts you've made that relate to why they've come to your journal. I love that. I've starting using it and did make the same mistake you did. It is just a new thing to learn and no need to be embarrassed. So, question. Using two of your layouts. Will you recode your layouts so you can use it? Or do we have to add a fix to our layouts? Yeah. And the beauty of it is you don't have to use it. I like that. I mean there are somethings I want it used on but somethings I likely won't. It is great. So updated things like this you'd be adding. I mean if you were to need help... just ask me but in general I try not to go back a recode things I've done unless it is something major. I didn't even notice this new option . . . obviously, as I'm here months after the fact. Mine are stacking on top of each other instead of being next to each other in a square shape like yours. Is do you have an idea what is causing that? It is usually that there is not enough room for them to be side by side but when I look at your journal they all appear side by side. Sets of three. Oh, sorry, I should have edited my comment. I changed my layout again and after I did that they were side by side. I realize this post is over a year old but I'll ask anyway. I was able to modify it to look sort of correct but the link and excerpt will not move to the left. It doesn't look right in IE (looks like a regular bulleted list with no images or text) so who knows about Safari or other browsers I don't have access to... which really makes me not to want to keep it. I don't understand why they wouldn't appear correctly when it certainly does for you. I reinstalled several themes multiples times, double checking the instructions just to be absolutely sure. Is there something I might not be considering? Hmmm. Let me tinker with it a bit and see. I do know that when a journal is a smaller width they tend to be responsive and move into a list view but you are right about being able to control them to some extent. I'll tinker and like you know. I have gone over this and over this and the only times I can recreate it is when I change the zoom of my page. So I do wonder if you need to reset your theme. When you go into the customization process there is a reset to default button next to the save changes button. I've had to do this before because I couldn't get something to work. You just reset and then re-set up everything. It isn't a fun prospect but I can't seem to figure out what the deal is here. This is what I have with a resolution of 1600x900 and the zoom in my browser at true to resolution. I know this isn't a lot of help but it is all I could figure out. Coding wise it is responsive and to try locking them into place really messes everything up.